Authentic and modern goose down feather duvets and advanced microfiber duvets. The 92% Down duvet is made from a 100% down-proof cotton outer fabric that prevents the feathers from escaping from the inside. It does not accumulate moisture, allowing the skin to breath. This duvet is ideal for people looking for a feather duvet with good thermal capacity and which lets the skin breathe. 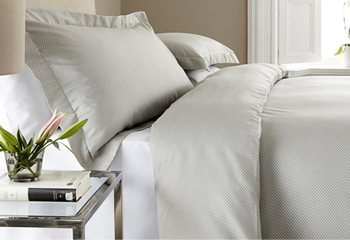 The Velfont Denver duvet is made from plain extra soft-touch microfiber fabric. The filling of the duvet is top quality Neotherm® hollow conjugated siliconized fiber, combining excellent thermal capacity and enhanced comfort. Made with horizontal fluting and an outer trim all around the edge.